Copied is a full featured clipboard manager. 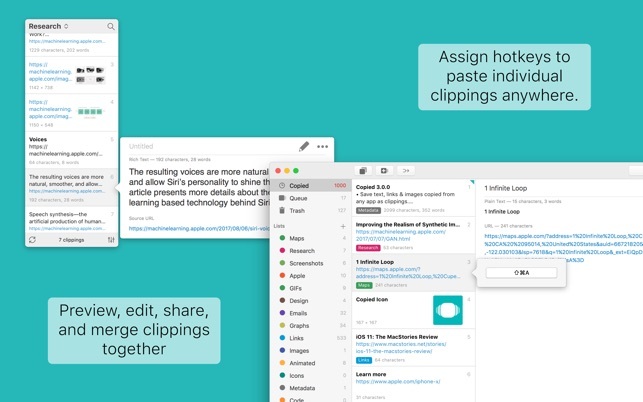 Save text, links, and images that you’ve copied to your clipboard from any app. Quickly access your saved clippings from the menubar and copy them back to your clipboard in its original format or in a variety of different formats using templates. Create lists and organize your clippings. Use hotkeys to select a list and copy clippings from the list without switching away from your active window. Copied also provides continuity between your devices. With iCloud Sync, you can pick up right where you left off on any device. 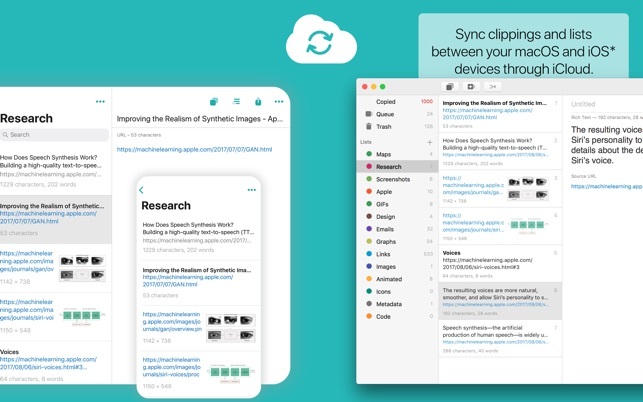 Copied uses iCloud Sync to sync your saved clippings and lists so that you can access them from any device. Save a copy of your clipboard. Copied supports text, links and images (JPEG, PNG, BMP, GIF, TIFF). 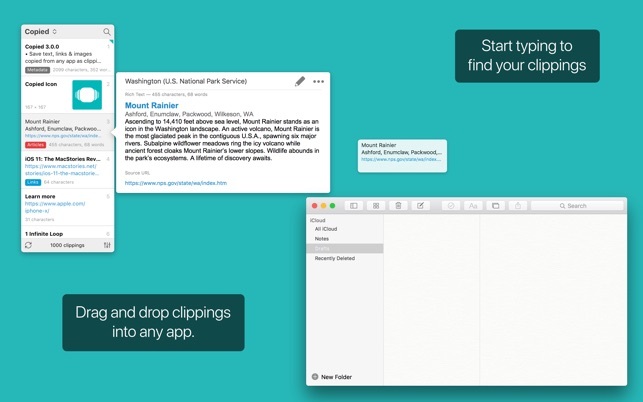 Drag and drop one or multiple saved clippings to paste them in any app. Make changes or merge multiple clippings together. Store and organize your clippings. Simply start typing to find a clipping. View the contents of your clipboard and apply text formatters directly to it. Clippings are automatically queued as you copy so that can paste them in same order with a hotkey. You can also undo copying and revert to the previous clipping. Copy clippings formatted with our built-in templates or create your own. Access clippings and lists on all your OS X and iOS* devices. User-configurable shortcuts allow you to quickly activate the app or perform actions without activating the app. Assign hotkeys to individual clippings to paste them anywhere. Control Copied from another app using scripts. *Copied is also available on iOS. Download it from the App Store. On iOS, Copied+ upgrade is required to sync between macOS and iOS devices. - Added a button to resume/un-pause the clipboard recorder in compact mode. - Synced changes did not immediately appear until switching away to another list and switching back. - Clipping text in list view appears clipped after changes are made to the clipping. - Empty lists will no longer show the contents of the previous list when switching lists using the left or right arrow keys. I miss what this program used to be pre-version 2.0. It worked perfectly and worked invisibly -- available always when you needed it and never in your way otherwise. Post-v2 ... eesh. Never mind that the hotkey shortcuts I'd been using since day one no longer were supported for no discernable reason. Suddenly, Copied went from nearly invisible to completely invisible every time it decided to quit without informing me. No crash message, no "Copied has unexpectedly quit" dialogue. Just... I'd type in my now-convoluted keyboard shortcut, and nothing would happen until I realized what already HAD happened (it quit hours ago) and restarted the program. Not the best situation for a clipboard manager you're expecting is working in the background and collecting text snippets you might be looking for (and now, not find) hours or even days later. With this latest version, it won't even boot up at all. No reason given, no message. Just ... starts up, flashes the icon in the dock for a second, then disappears. Happens on both the laptop and the desktop. Not sure if the absurdly problematic High Sierra is to blame at all, but it really doesn't matter at this point. I've moved on to Paste, which boots up reliably, lets me use my old keyboard shortcuts, and just works (TM) like Copied once did. …organize, repaste utility I’ve ever used. Many IOS apps I use are not necessary to have across all three of my devices: iPad Pro, iPhone7 and MacBook, however, some are and make my life a whole lot easier, and this is one of them. As a student and entrepreneur with a busy schedule and multiple todo lists, calendars, writing assignments, notes, etc, I am copying and pasting information all day, all night and it's nice to have a way to categorize and keep all of these pieces of important information so I can make a time to go through my lists and assign what I have copied into all of the appropriate areas. Also, I use digital textbooks at all times when possible , plus need to read many research PDF's all of which allow for note taking, which allows me to go back, copy and paste my notes into a folder for study guides or for writing papers. I know that there is now a universal copy and paste feature across all new Apple devices, but this is an easy, fully functional, quick, convenient and inexpensive app that should come as the standard for copying and pasting. I’ve used Copied for a long time, but after I installed it to a new MacBook Pro with macOS High Sierra, I noticed a couple of very minor issues. First, the default installation had the Copied window detached on my desktop and there was no apparent way to close it. Also, by default every time I click “Copy” I had to listen to Copied’s sound. It took me awhile to find where to turn this off since it’s call “Tone” in the Preferences and not “Sound”, which to me is not intuitive. Also, I finally found how to display the control for closing the UI window. It was a sub-line in Preferences under “Detach Window”. Again, could be a lot more intuitive. 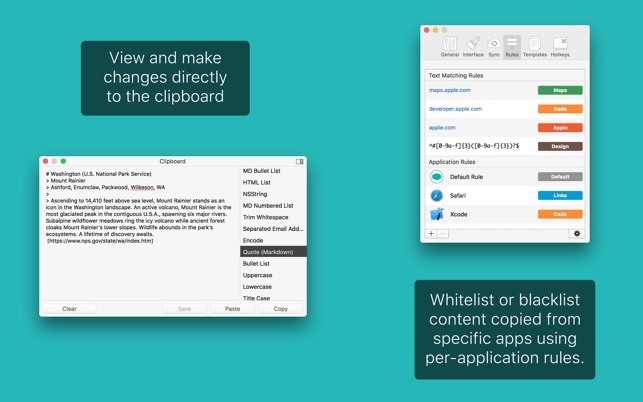 The good part is that Copied is one of the best clipboard managers available if you’re only comparing those which work on both the Mac and iOS devices, and there are only a few. I think the UI could be prettier, but that’s only my opinion and certainly doesn’t stop Copied from doing its job. Some of the nicest looking clipboard managers cost more and do less.